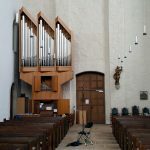 can an organ work outside of a church space ? To release this instrument from the confines of religious spaces onto the streets of Magdeburg for all to hear will be a good thing. Sonically extraordinarily rich and malleable. Should be for more than church goers. Question: is it possible to create a new organ music that pulses and floats in shifting patterns through combining and removing different notes at different street corners from a small sound system moving through space? ie. can the rich variety of the organ be realised on the street away from the extraordinary acoustics of the church space? 17B, Ellingfort Rd, London E8 3PA. UK. We're not around right now. But you can send us an email and we'll get back to you asap. I consent to Bicrophonic Research Institute collecting my details through this form.